Born in Atlanta, Taylor Branch is an American author and historian best known for his award-winning trilogy chronicling the life of Dr. Martin Luther King Jr. and the history of the American civil rights movement. The first volume, Parting the Waters: America in the King Years. 1954-63, published in 1988, received the Pulitzer Prize for History, National Book Critics Circle Award for general nonfiction and the 1989 Anisfield-Wolf Book Award for non-fiction. The second volume, Pillar of Fire: America in the King Years, 1963-65, followed in 1998. Among its recognitions were the American Bar Association's Silver Gavel Award and the Sidney Hillman Book Award. 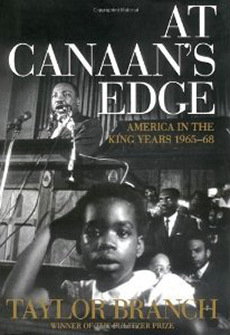 He completed the trilogy in 2006 with the publication of At Canaan's Edge: America in the King Years, 1965-68. Branch attended the University of North Carolina-Chapel Hill on a Morehouse Scholarship. He graduated in 1968 and went on to earn an M.P.A. from the Woodrow Wilson School of Public and International Affairs at Princeton University. He received a McArthur Foundation "genius grant" in 1991 and the National Humanities Medal in 1999. In 1972 Branch helped run George McGovern's Texas presidential campaign. One of his co-leaders in that effort was Bill Clinton, who would later become President of the United Slates. Branch is currently working on Wrestling History: The Bill Clinton Tapes, based on hours of late night conversations with the former president in the private residence at the White House. Branch Lives in Baltimore, Maryland.